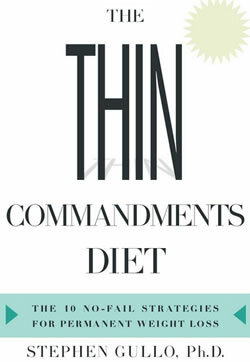 The Thin Commandments was created by bestselling author of “Thin Tastes Better”, Dr. Stephen Gullo. This book outlines the program that has allowed his patients to achieve a very high weight loss success rate. The plan centers on ten weight loss strategies – referred to as commandments – combined with a simple and satisfying diet plan. Part one of the book is devoted to the ten “Thin Commandments”. These are actions that allow you to gain control over your eating habits and food choices. For instance with the first commandment, Strategy is Stronger Than Willpower, you are provided with practical techniques. Examples of these include keeping a food diary, avoiding restaurant buffets, staying away from trigger foods and watching for hidden calories. In part two Gullo presents his ABC Diet Plan, which includes three stages. You start with the 10-Day Turbocharge, which is designed to help you lose weight quickly and easily. This plan is centered on A-list low calorie foods that have an appetite-suppressing effect. B-list foods are for dieters who want to stay on the program longer than ten days, or have more than ten pounds to lose. In this phase your rate of weight loss will be a little slower. C-list foods are recommended for when you have achieved your goal weight and are ready for maintenance. Ideas are provided for breakfast, lunch, dinner and snacks for each phase of the diet. There are recipes and suggestions for quick and easy, gourmet, on-the go and fast food meals. The Thin Commandments also includes a lists the 110 best light foods that provide you with great flavor without too many calories. Seafood, eggs, chicken, turkey, bison, light yogurt, low-fat cheese, low-fat milk, GC Scandinavian Bran Crispbread, Boca burgers, cucumber, broccoli, cabbage, asparagus, mushrooms, salad greens, green peppers, grapefruit, cantaloupe, apples, strawberries, fat-free mayo, calorie-free chocolate dip, low-salt chicken broth, tomato juice, coffee, tea, diet soda. Gullo says it is very important to incorporate fitness into your weight loss regime. However no exercise “can compare to the exercise of good judgment with your food choices”. He explains that exercise supports your goal to lose weight because it provides you with motivation and structure. It also helps you to stop obsessing about food as you learn to focus on creating health. The Thin Commandments: The Ten No-Fail Strategies for Permanent Weight Loss retails at $24.95. Click Here to purchase The Thin Commandments for a discounted price. Emphasizes low calorie foods that help to suppress appetite. Provides options for quick and easy meals, fast food and frozen dinners. Includes a detailed meal plan with recipes. The Thin Commandments offers a specific eating plan for maintaining your weight loss. The first ten days will probably produce rapid results. The first ten days are very restrictive and require elimination of many foods. Encourages the use of “diet foods”, many of which contain artificial ingredients. May be difficult to find some of the recommended products in regular grocery stores. Will not appeal to dieters who don’t like structured meal plans. The Thin Commandments helps you understand your food history and eating behaviors so that you can develop practical weight loss strategies. The book also includes detailed meal plans to take the guesswork out of food choices. Most dieters should lose weight on this program because it centers on high-fiber, low calorie foods. However, many processed “diet foods” are also included, which are best avoided due to their potentially negative health effects.